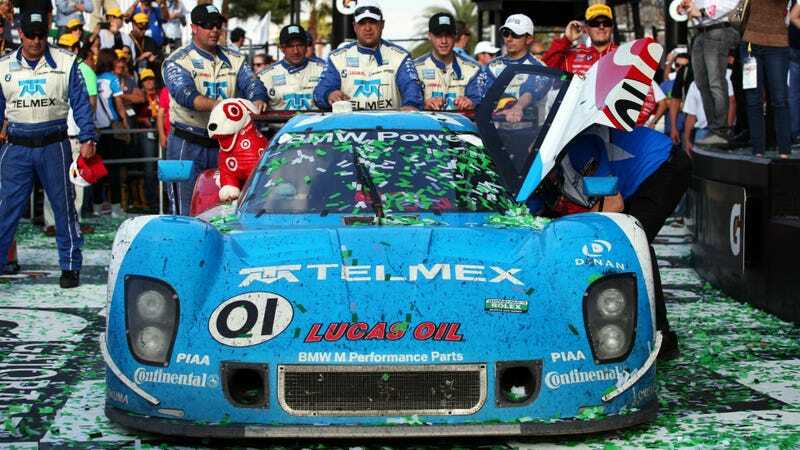 After their first win in 2011, Chip Ganassi Racing with Felix Sabates won the Rolex 24 Hours at Daytona with its #1 TELMEX/Target BMW Riley prototype, powered by a Dinan Engineering tuned BMW engine. M Power got its first overall win at Le Mans in 1995 bolted in the middle of a McLaren F1 GTR, but it was four years later when they triumphed with their own prototype, the V12 LMR. After the GTRs become underpowered, BMW decided to develop a Le Mans prototype with the help of 1996 and 1997 F1 Champions, the WilliamsF1 team. In 1998, the V12 LM was presented with the 5,990 cc version of the legendary S70 engine. And it was pretty much an instant failure. During its first tests, the LM turned out to be slower than the best of the GT1 class (including the McLaren F1 GTRs), then at Le Mans, vibrations detected in the drivetrain meant that both cars had to retire quite early. These disappointing results made BMW decide to sell the two cars to privaters (who were crazy enough to buy them), while the team went back to the drawing board at Williams. They resurrected with an Art Car that could win. The BMW V12 LMR retained the basic carbon and aluminum honeycomb monocoque of its predecessor, but the bodywork was completely new in order the get rid of the cooling and aerodynamic problems of the previous season. The cooling ducts went to the top instead of the bottom, so that tarmac temperature could not effect the engine's performance, which was estimated around 580 horsepower. Williams built four chasses at their UK headquarters, of which two were entered at the 12 Hours of Sebring by both BMW and Schnitzer Motorsport. While chassis #001 was crashed beyond repair, the second car took the overall win. For Le Mans, one of the three remaining cars was painted by American artist Jenny Holzer, who turned it into a very special member of the Art Car family. But that wasn't enough for it to win. After 365 laps with Pierluigi Martini, Yannick Dalmas and Joachim Winkelhock behind its wheel, the fastest LMR had only a few Dell stickers on its body. Following the success, BMW took the LMR to North America, where it battled against Panoz prototypes, scoring quite a few wins once again. But since the Bavarians stepped into F1 the next year, the idea of a new contender for Le Mans was short lived. So came Audi, only to become the most successful team in modern Le Mans history starting in 2000. On the other hand, BMW's F1 adventure turned out to be a rather bitter one, so nobody was too surprised when they pulled the plug in 2009.